It’s been a few years since Pitfire Pizza had found a special place in my heart. Though I first became surprisingly enamored with the well built-out chain starting with the unveiling of their Culver City location, I was surprised to learn that they’re actually celebrating the 15th anniversary of the first, their North Hollywood location, this year. 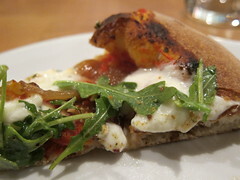 Their quality is ensured by a well sized, manageable menu that joins the locations together. If you only order pizza, you’re actually missing a big part of their appeal. They always have excellent vegetable sides and well executed pastas to cover all their bases. 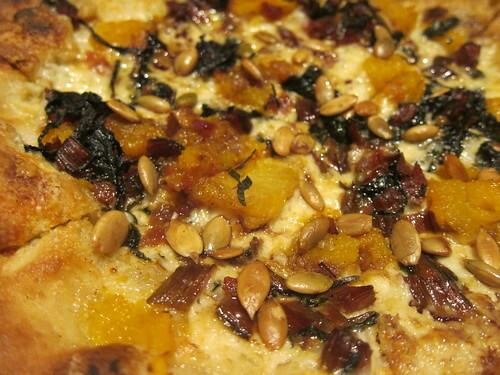 And now, you’ll have fall flavors to look forward to on your next visit, starting with their Roasted Pumpkin Pizza with kale and pumpkin seeds. What Will They Be Eating at The 63rd Annual Primetime Emmy Awards? I don’t cover a lot of entertainment news on this blog, but when it comes to Los Angeles and the entertainment industry, the latter is an undeniable part of our culture as…well, television. Tomorrow, our TV stars will be gathering at the L.A. Convention Center for the 63rd Primetime Emmy Awards Governors Ball, and Patina will be catering the star-studded, “mod illusions”-styled event for only the 16th time. The Governors Ball will be painted in black and white and everything nice. Awhile back, I got a chance to get a glimpse of the motif as well as taste miniature versions of the courses guests will be enjoying tomorrow. 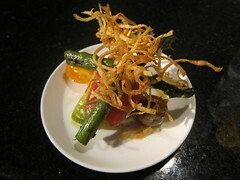 …Such as this Windrose Farms heirloom tomato salad with rosemary and cherry wood-grilled asparagus. Fried gold potatoes and fried crisps decorate the top of the dish. This is a great first course to close out the summer. 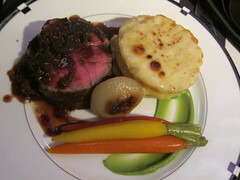 The entree course tomorrow will be Filet Mignon with an oxtail bordelaise. Gratin of macaroni (that is, a cylindrically-cut tower of horizontally-layered tube pasta with Vermont white Cheddar) and rainbow baby carrots line the plate as do a cipollini onion and caramelized broccoli emulsion. Unless you’re vegetarian, it’s pretty hard to argue with a Filet. It’s also hard to argue with macaroni and carrots. With a 3-course menu this simple, it’s clear that Patina is going with ingredients that will provide the least fuss for a – let’s face it – potentially fussy bunch of diners. I’m still curious as to what they’ll feed to the vegetarians and vegans. This is L.A., right? Patina will be on-hand to take care of all the needs of all 3600 sat-down guests. They’re well-equipped in the front and back of the house to tend to all dietary preferences and restrictions. 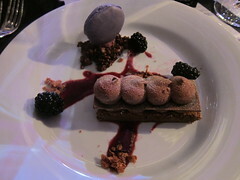 The dessert course, in all its glitz and glamour (and glitz), would be a vegan-banned course as well. The Duncan Hines milk chocolate brownie is ensconced in chocolate blackberry cream and chocolate rice crisp. Blackberries line the plate and flavor of the lone macaron on the side. 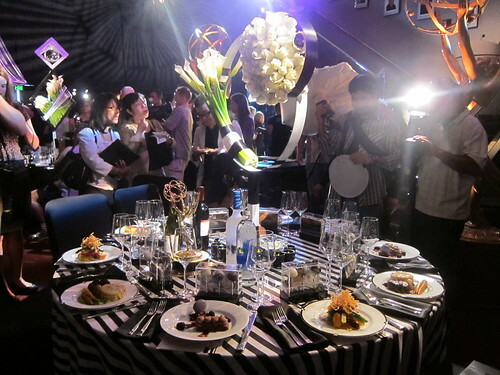 And all three of these courses will be served in a setting that is designed to trick the eye, complete with a 60-foot, centralized and elevated, circular dance floor and orchestra platform. 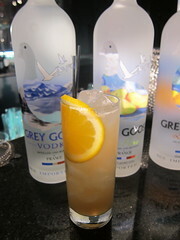 Combine Grey Goose L’Orange flavored vodka, BÃ©nÃ©dictine, grapefruit juice and agave syrup in a shaker and shake vigorously. Pour all contents into collins glass filled with ice. Top with ginger ale. Garnish with orange wheel (optional). It may be September, but it sure still feels a little like summer in Los Angeles. Enjoy what’s left of it…and enjoy the weekend! 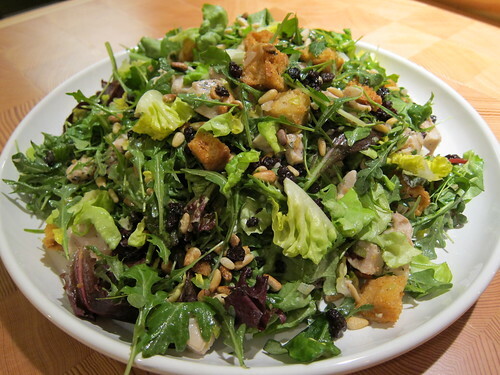 I’m especially excited to try the Sausage and Spring Greens Pizza – I love fennel and in my past experience at Pitfire, the produce has been nothing but fresh. The crust has lots to be vouched for; rarely do I find a crust this interesting, especially on this coast!! It’s nice and buttery when you get to the edge of the pie.